LIVINGSTON MANORS ROB Baker, left, and Libertys LaKarri Byrd chase after the basketball in Thursday nights opening round game of the Billy Moran Tip-Off Classic Tournament at Sullivan West High School. 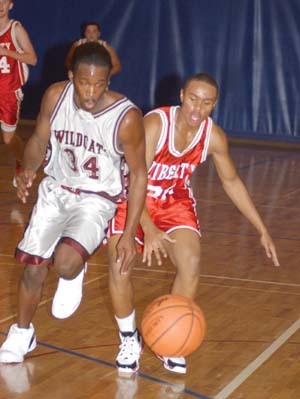 LAKE HUNTINGTON  December 7, 2004  The Liberty Indians and host Sullivan West Bulldogs scored victories on Thursday night in the opening round of the 2004 Billy Moran Tip-Off Classic Boys Varsity Basketball Tournament. The Indians squeaked by the Wildcats of Livingston Manor, 61-51, in the first of two games that were held in the gymnasium of the Sullivan West High School campus in Lake Huntington. Liberty (1-0) outscored the Wildcats in the opening period 13-9, by eight (16-8) in the second and by a 24-14 margin in the final quarter. The third period was a different ball game, however, as the Wildcats outscored Liberty 19-8. It was a rebound effort that caused considerable consternation on the Indians bench. Libertys Jared Levine was the games high scorer with 16 points. LaKarri Byrd also reached double digits, netting 11 points on the evening. Mike Perry was the only player to score at least 10 points for Manor (1-1). He recorded a total of 11 in the contest. Liberty was 14-of-24 (58 percent) at the free-throw line, while the Wildcats were 11-of-26 (42 percent) at the line. In the second game of the evening, the host Bulldogs of Sullivan West ran past the Chapel Field Lions by a final score of 56-18. The Bulldogs outscored the Lions in every quarter of the game: 22-9, 15-2, 14-5 and 5-2. While the Lions were bench-poor with only a couple of spare hoopsters waiting in the wings, the Bulldogs had nine substitutes who were eager to take to the court. At the half, SW (1-0) enjoyed a 26-point lead. In the final frame, Bulldog Head Coach Rick Ellison and Assistant Coaches Cliff Kelly and Bob Menges cleared the bench so those aforementioned substitutes could pick up some floor time. Leading SW to the win were seniors Sean Kelly and Joe Meyer. Kelly scored a game-high 15 points and Meyer netted 12 points. SW was 4-of-13 (31 percent) at the foul line, while Chapel Field went 4-of-11 (36 percent) at the line.